When most people think of surrealism, Salvador Dalí's melting clocks and Luis Buñuel's icky eyeball slicing in Un Chien Andalou are the first images that come to mind. But those artists had explicit political aims. They sought to disrupt the human psyche in much the same way that terrorists disrupt society through random violence. 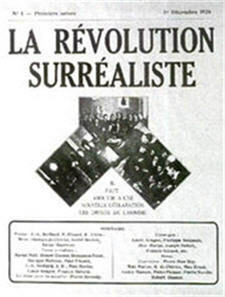 Surrealism was primarily a revolutionary political movement; art was its by-product. "Surrealism as a visual movement had found a method: to expose psychological truth by stripping ordinary objects of their normal significance, in order to create a compelling image that was beyond ordinary formal organization, in order to evoke empathy from the viewer." 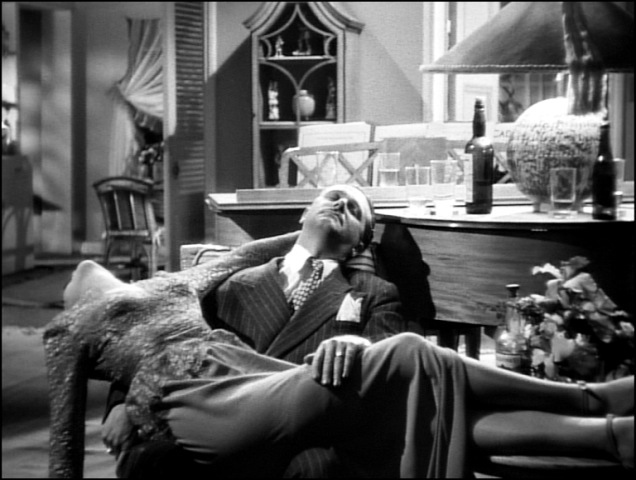 Gleefully irreverent, this role-reversed Pietà from Alicia Huberman's party in Notorious could only have been conceived of by an iconoclasting surrealist. Max Ernst, The Blessed Virgin Chastising the Infant Jesus, 1926. Hitchcock told François Truffaut that he "practiced absurdism religiously." 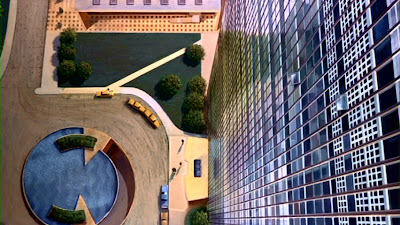 In fact, he described North by Northwest as a "fantasy of the absurd." 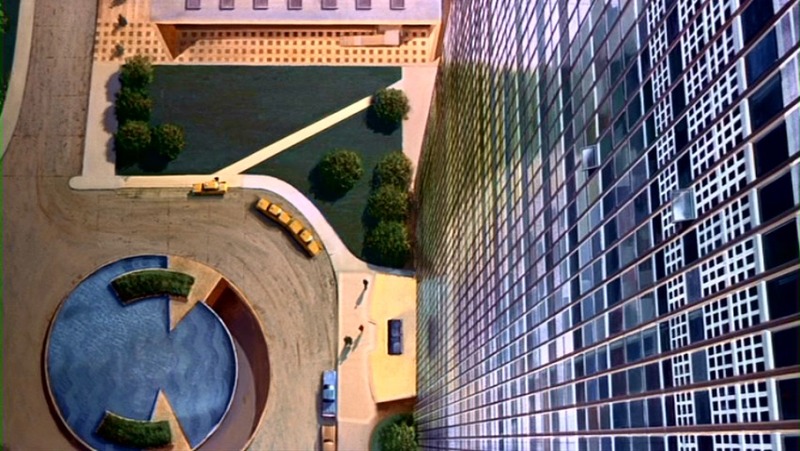 From this high-angle point of view at the United Nations building, Roger Thornhill (Cary Grant) seems about as significant as an ant as his nightmare intensifies. 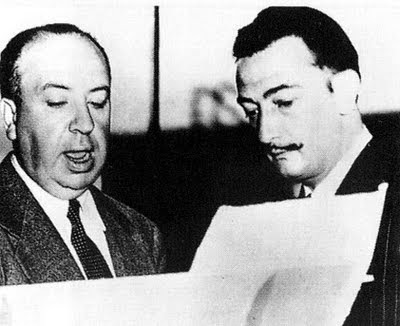 Summing up the film's artistic and political statement, this matte-process shot is as surreal as anything by Dalí. 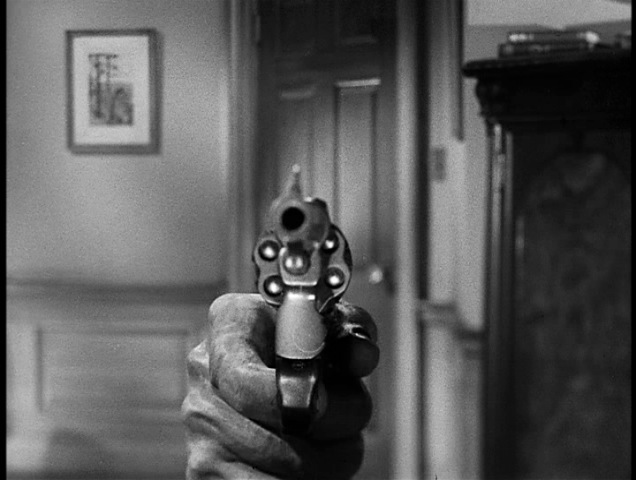 I don't think Hitch dropped absurd surrealist flourishes into his movies just to imbue them with a sense of the weird (though that was a motivation too). He was critical of the international political scene of his day and was ambivalent about who were the good guys and who were the bad guys. 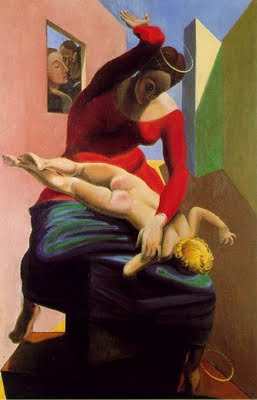 "The characteristics of this style - a combination of the depictive, the abstract, and the psychological - came to stand for the alienation which many people felt in the modern period, combined with the sense of reaching more deeply into the psyche, to be "made whole with one's individuality." 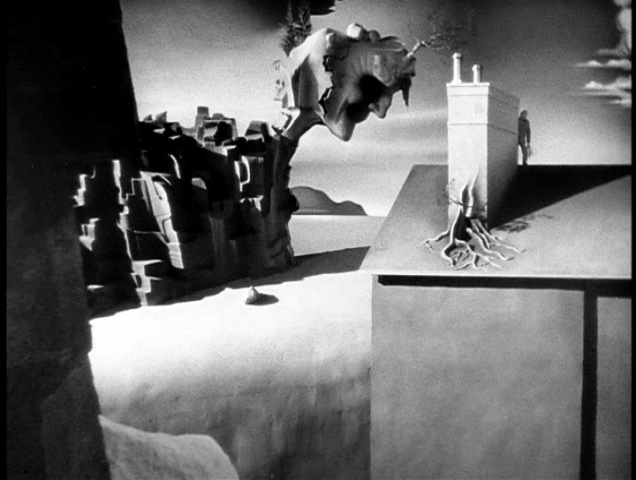 14 years earlier, the Dali-created dream sequence of Spellbound got all the attention in that movie. But there are several more surreal touches in that film. 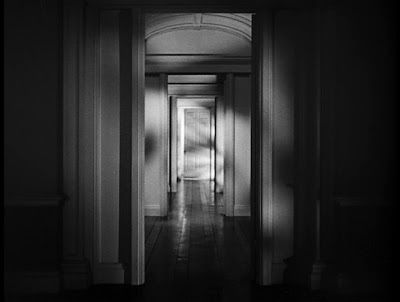 The series of doors that whip open during Constance and J.B.'s kiss (Ingrid Bergman and Gregory Peck) symbolize the doors of her subconscious flying open -- a surreal, symbolist touch. My favorite non sequiter in all cinema: when lovestruck Ingrid gushingly asks for "liverwurst!" Breton once declared that "the purest surrealist act would be to go into a crowd and fire a gun at random." 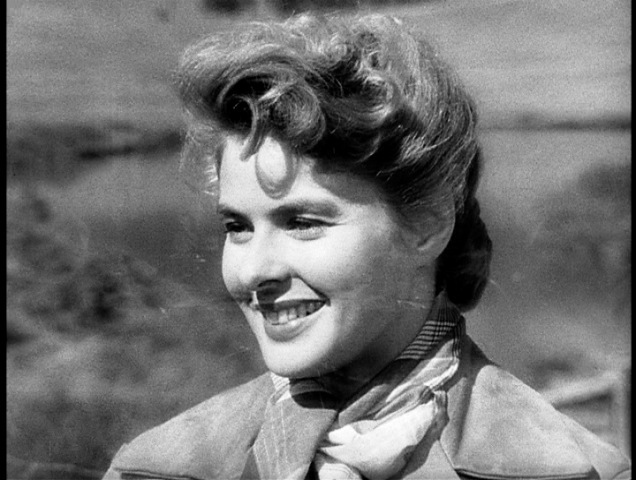 Hitch neatly pulled that idea off at the end of the movie, offering up a close-up of a suicide gun that fires into the audience, followed by the non sequiter of Gregory Peck and Ingrid Bergman laughing it up at the train station. Hitch would have liked to do more of this kind of thing in the film, but his conflicts with Selznick prevented it. 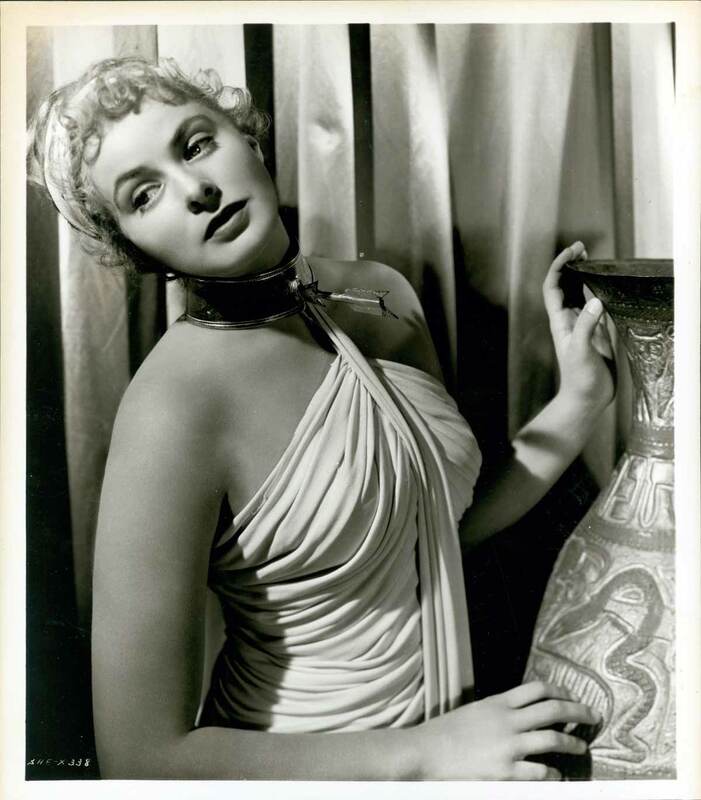 Publicity still of Ingrid Bergman from a section of the dream sequence that was cut from the film. I TOO love Bergman's famous utterance of: LIVERWURST! How funny! I thought I was the only nut out there who loved that line AND the way Bergman said it. A great later example of Surrealism in Hitchcock's films is THE BIRDS, which drips of it. One early example is the close-up shot of Tippi Hedren's glove hand: blood appears on the outside of the glove on the inside of the hand, mimicking her hidden red nails.